Everybody’s talking about NLP. So, what is it and what can it do for your business? Neuro-Linguistic Programming is a combination of psychotherapy, communication methods, hypnosis and personal growth techniques which aim to maximise individual capabilities by re-training the brain to adopt positive patterns of behaviour. It has been used to address social phobias, anxiety, obsessive-compulsive disorders and is equally effective in the management of organisations and their employees. 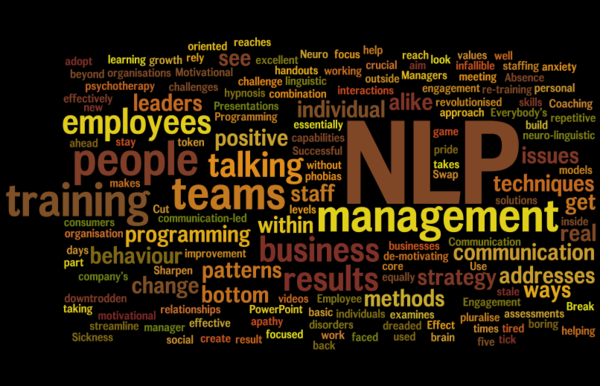 Here are five ways in which NLP can help you and your business. We all know the basic rule. Successful businesses rely on its leaders, employees and consumers talking well with one another and staying focused as a result. Neuro linguistic programming addresses communication issues within teams when faced with clients and customers alike. It is also crucial in management strategy and implementation. Cut your meeting times, streamline your interactions and build positive talking relationships on the inside and outside of your business with NLP. The dreaded PowerPoint can be revolutionised with NLP, helping you reach your people more effectively. Swap boring handouts and stale training videos for real, people oriented training. Sharpen and pluralise your approach to learning techniques and create new and motivational ways of working. You won’t look back. Managers are not infallible, and NLP addresses the human potential and shortcomings within each individual manager and their methods. Coaching models, strategy assessments and people management skills training with NLP reaches beyond a token gesture Effect a real change and improvement for leaders and their teams alike and see the results. What makes your employees tick? Are they clocking in and out or taking pride in their work? NLP can get to the bottom of your staff apathy issues and challenge the core values of your organisation, without criticising or de-motivating your teams and individuals. NLP can focus on your staffing levels and get to the bottom of all those ‘duvet days,’ once and for all. Motivational change, engagement of your teams and communication-led solutions are all part of the programme with NLP, be prepared to see dramatic results in your company’s morale. NLP is essentially about people. It takes patterns of behaviour, then examines and challenges them, with excellent results. Break through the mould of repetitive training, indifferent management and tired, downtrodden staff. Use neuro-linguistic programming to stay ahead of the game. This article was written by Helen, an experienced provider of NLP training in London.